Above; The view from the castle. Right; The castle from the garden. 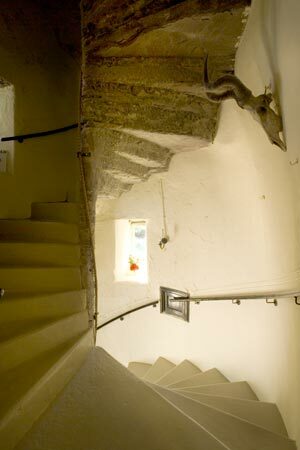 Below right; The main stone spiral stairs or Great Trumbel. This unique Medieval Castle, also known as "the Black Castle" offers luxurious B&B accommodation on the shores of Loch Creren near Oban. 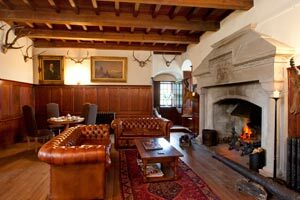 Barcaldine Castle offers a truly unique experience. If you are looking for luxurious, opulent and romantic accommodation, nowhere else on the West Coast of Scotland parallels Barcaldine. 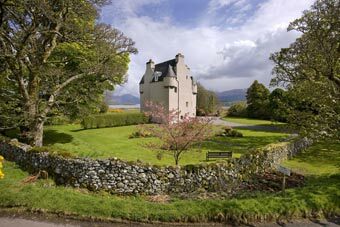 This historic Scottish Castle, built in the 16th century, is set on the shores of Loch Creren and enjoys breathtaking views of the snow-capped mountains of Glencoe in early Spring to the beautiful golden colours of Autumn. The sumptuous interiors are carefully designed to encourage guests to immerse themselves in the atmosphere of relaxation. Surrounded by some of Scotland's finest landscapes, there is so much to see and do in the local area. Whether you are simply looking for a break from the hustle and bustle of daily life, a golfing weekend or if you want to experience the great outdoors, you will be sure to find something to suit you. If you need advice on the best activities based on your preferences and time of visit, just ask. There is a great selection of fantastic restaurants and eateries nearby including the Oban Chocolate Co. where you can enjoy a light bite and The Waterfront, a seafood restaurant serving locally caught fish. There is something to cater for all palates and tastes. Children love it here and families are welcome, as are couples who would like to get married at the castle. 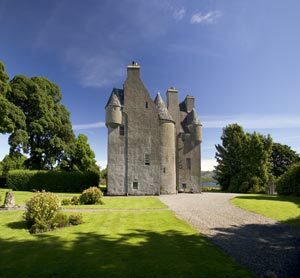 Barcaldine Castle is a memorable wedding venue. Two views of the Laird's Parlour - a sitting room with an open fire. Complimentary sherry and chocolates. There are five bedrooms each with a bathroom en-suite. Each has rich and luxurious fabrics to create a traditional look and a deeply relaxing and romantic ambience. All are individual in shape, size and design, with a king size bed, luxury bedlinen and pure new wool throws. You will find complimentary WiFi, a flat screen HDTV with Blu-ray/DVD player, with films available on request, along with a good selection of games and magazines. Tea and coffee making facilities, complimentary water, bathrobe, slippers and hairdryer. Luxury toiletries provided by Arran Aromatics. Barcaldine Room. 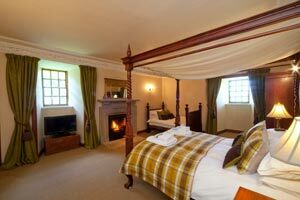 A canopied double bed (5' kingsize) and bathroom en suite. Breadalbane Room. King size (5ft) 4 poster bed with an en-suite bathroom with bath and walk-in shower. All the beds have good quality modern mattresses. For a cot/crib – please ask. Breakfast is served from 8.30 until 9.30am. Please say if you require an earlier breakfast - or a continental breakfast on a tray for your room. Packed take-away continental breakfast also available. A choice of fresh fruits juices. Porridge with a variety of toppings (Served with a choice of brown sugar and raisins, Whisky and brown sugar, honey and berries). Fresh fruit salad served with Greek yogurt. Cranachan made with mixed scottish berries. Full Scottish breakfast: (Bacon, pork sausage, mushrooms, tomatoes, potatoes, eggs any style with homemade granary or white toast). Full Vegetarian Scottish breakfast: (Vegetarian sausage, mushrooms, tomatoes, potatoes, beans, eggs any style with homemade granary or white toast). Scrambled eggs over smoked salmon with homemade granary or white toast. Smoked haddock and poached egg with homemade granary or white toast. Famous Loch Fyne kippers served on homemade granary or white toast and topped with poached egg. Blueberry pancakes with creme fraiche and maple syrup. Selection of homemade breads and preserves. Selection of coffees, teas and herbal infusions. 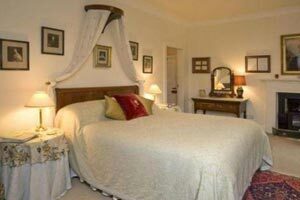 "A real Scottish experience of good hospitality, a privilege to stay in such a lovely place." Stewart and Katherine. Essex. "Beautiful setting, terrific breakfast, wonderful beds." Maureen Dow and Laura Wilson. Kent. A wedding at the Castle? Please ask. Rates are in Pounds Sterling are inclusive of full breakfast and VAT at the current rate of 20%. For availability and to book see Barcaldine castle's own website: barcaldinecastle.co.uk/reservations (this link opens a new window). Check-in is at 4:00pm, check-out by 10:30am. 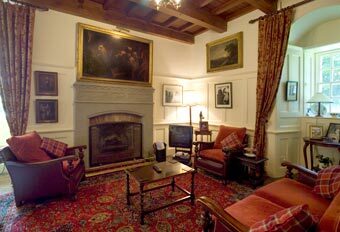 For availability and to book see Barcaldine castle's own website: www.barcaldinecastle.co.uk/contact.htm (this link opens a new window). 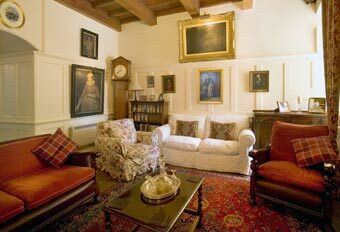 Please mention that you found Barcaldine Castle through About Scotland! "In the foreground Loch Creran backed by the notoriously forbidding mountains above Glencoe and further north the distant peaks of Ardgour beyond Appin. South west lies the shimmering Loch Linnhe, widening to the expanse of the Firth of Lorne backed by the cloud shrouded heights of Mull." Eating out nearby: The Hawthorn Restaurant - a mile away, and just a little further away, the Oyster Inn and the Wide Mouthed Frog, then the Pier House at Port Appin, and of course there is Oban.